The larger-than-life exploits of the top journalists have always fascinated me. It’s nerdy, I know. While many people love nothing more than reading gossip about the latest reality TV stars, I can’t get enough about what it’s like to work on Fleet Street (technically, almost no journalists work on Fleet Street anymore, but you know what I’m getting at). In fact, this obsession with journalism is what first got me into PR. Now I’ve read far too much about journalism already. Stick It Up Your Punter by Peter Chippindale and Chris Horrie showed me the reality of working under firebrand editor Kelvin MacKenzie in the 1980s. My Trade by Andrew Marr was great at explaining how political journalists operate. And News From No Man’s Land by John Simpson provided a window into what goes on in the messed up world of war correspondents. As it happens, John Simpson also provides what for me was the star exhibit in the Imperial War Museum North’s latest exhibition War Correspondent: reporting under fire since 1914. John Simpson’s burqa, which he wore when sneaking into Taliban-occupied Afghanistan in 2001, has come to symbolise just how far journalists will go to get a story. It’s joined by other items that have deservedly taken their place in journalism folklore, including the bullet that almost killed Kate Adie in Lebanon and Martin Bell’s white suit. Plenty of museums have impressive exhibits, though, but what separates the good from the great is how much care has gone into drawing visitors in. Modern museums need to do so much more than show a row of glass cases, and this is where Imperial War Museum North excels. Specially commissioned videos and audio from the likes of John Simpson and Jeremy Bowen show how they juggle drop-of-a-hat assignments with family commitments, how they pack for the next trip and even how they cope with the loss of a colleague. These bring home the reality of life as a war correspondent better than any book. Imperial War Museum North calls this “the UK’s first major exhibition about British war correspondents”. Some of the featured journalists also suggest that it may be the last, as the rise of citizen journalism and social media transforms the role of war correspondent from news-gather to news-editor. I really hope we aren’t witnessing the death of the war correspondent. This exhibition reminds us all that they’ve done a remarkable job of keeping Britain informed over the last hundred years. And, in my case at least, their larger-than-life exploits have provided more than their share of entertaining stories. 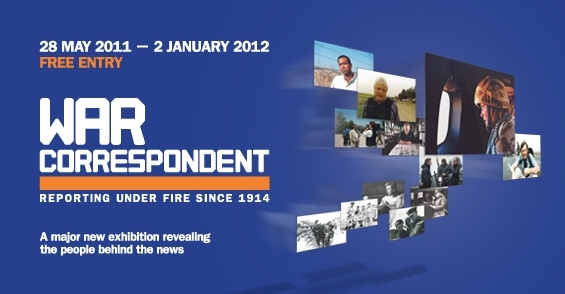 War Correspondent: reporting under fire since 1914 runs at Imperial War Museum North in Manchester from now until Sunday, 2 January 2012. Entry is free. I’m a big advocate of J-Bo (Jeremy Bowen). He’s one of the best broadcasters on the planet.